I recently got caught up in a wild goose chase that led me to the International Gift Show at Tokyo Big Site, the city's McCormick Place equivalent for any Chicagoans out there in Readerland. This was my first (and hopefully last) foray into Japan's wholesale gift items market. Filling all of Big Site's ten exhibition halls, the array of merchandise ran the gamut from aroma therapy supplies to entire zoos of stuffed animals. Quite honestly, most of it was pretty ghastly. But I captured a few blogworthy items with my camera (despite the prohibition on photography). Below are two of my personal favorites. 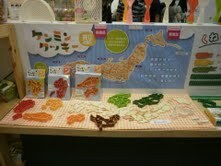 When these cookie cutters appear on the shelves of Tokyu Hands later this year I definitely want to be there. 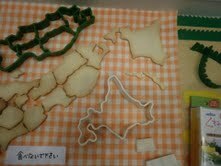 All 47 Japanese Prefectures rendered in sugary dough? Sounds scrumptious. Not sure we have the patience to cook up the entire country but we could certainly try. Perhaps Hokkaido, pictured below, would be a good place to start and then we could head south from there. Aside from anime and automobiles, one of Japan's most visible exports has got to be character goods. Hello Kitty has a way of turning up in the darnedest places! For the most part, I am indifferent to these fads. But I must confess a great fondness for Kapibara-san who debuted several years ago, just in time for Eve's birthday. How could anyone resist this genderless critter with its stubby, little legs and endearing expression? Smitten, I bought a mid-sized version for the birthday girl, kicking off a mini-kapi boom of our own. On both national and familial scales, the fever has cooled. Yet I still have a soft spot for these furry friends inspired by capybaras, those water-loving rodents from South America. 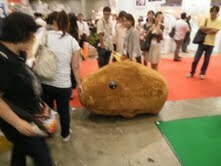 At the gift show, someone offered to take my picture with this giant kapibara but I took these photos instead.